Animals bring smiles to babies’ faces. The two farm animal puppets included in this parent pack will provide lots of entertainment for babies. 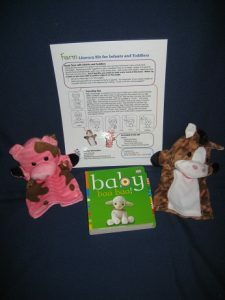 This parent pack also gives reading tips and parenting tips on how to teach babies simple sign language. 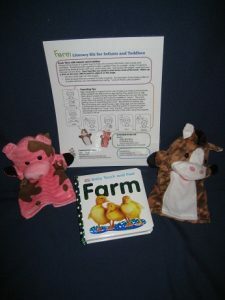 It offers suggestions on how to use the puppets as well as other activities to teach baby about farms and farm animals. 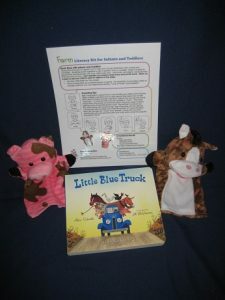 Included in the parent pack, along with the two puppets, is a two-sided guide and your choice of any one of three board books: Baby Baa Baa, $16.00; Baby Touch and Feel Farm, $15.00; and Little Blue Truck, $16.00, all housed in a clear, plastic, zippered pouch.